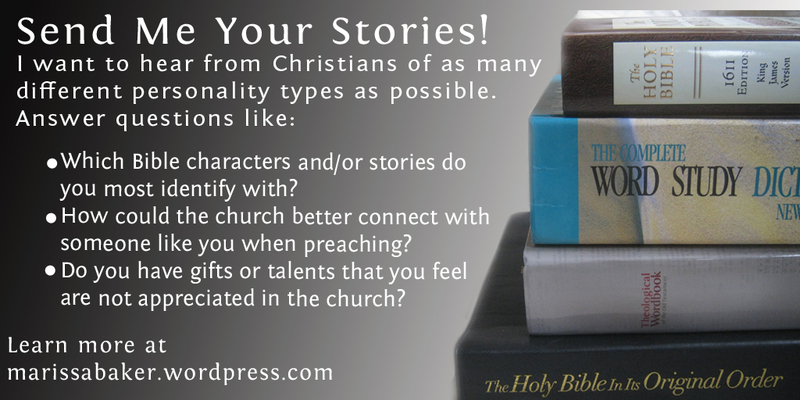 The first question I asked for this project was which Bible characters and/or stories you identify with most. 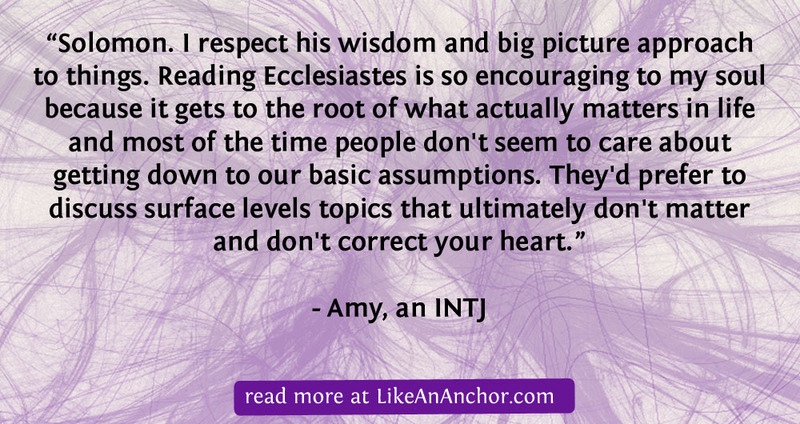 INTJs tended to chose Bible Character who they felt shared their perspective on the world. Because an INTJ’s dominant function of Introverted Intuition (Ni) gives them a perspective on things that’s unique to them, I wasn’t surprised that the six INTJs who shared their stories with me each chose a different character except for two who mentioned Paul. Teenage INTJ Hannah said, “I identify with Deborah the most. I’ve always felt a strong connection to her, because she stood up for what was right and seemed rather fierce.” Another INTJ woman said she had a hard time answering this question because “There’s a lot of men in the Bible, with women in the fringes often times.” She did, however, relate to Moses and Paul at times. Intuitive types only make up about 30% of the population, and it’s not uncommon for them to struggle with knowing how to fit into Sensing-dominated social groups. This struggle carries over into the church. On top of that, churches are often set-up to favor Extroverts, and Introverts can feel drained by the pressure to socialize. A comment from an INTJ called AC sums up these struggles nicely. “I feel Church is very much geared towards extroverts, especially Evangelical and modern churches. More traditional churches I feel still think women have cooties. I jest but it also angers me. “I find church very draining and I’ve experienced burn out several times. I don’t want to work (volunteer) on Sundays. I want to sit and listen in peace. And rest. Modern churches, some traditional too, don’t seem to get this. I also don’t want to socialize. I wish everyone well around me and will pray for them and want to. I understand we’re all in this together. But I don’t want to talk about the weather usually and signing up for “x” activity. Activities drain me and I often don’t see the point if the cost benefit is really low or if we’re reinventing the wheel needlessly. If you’re a Christian Introvert, you might find by Adam S. McHugh’s book “Introverts in the Church: Finding Our Place in an Extroverted Culture ” a valuable resource. Please note that this is an affiliate link, which means if you purchase the book I’ll get a small commission at no extra cost to you. All Intuitive types, especially NT, can struggle with fitting in. It seems, however, that INTJs are particularly susceptible to feeling that who they are deep down inside is not accepted in Christian churches. Social expectations are a particular struggle for them. This isn’t because INTJs don’t like people or are naturally rude (which is an incorrect assumption that many Sensing and/or Feeling types might make). Rather, most church groups aren’t set-up to provide the type of socialization that energizes and engages INTJs instead of boring them and draining their energy. INTJs can make themselves participate in social activities they don’t find comfortable if they see a point to it, but those activities aren’t going to make them feel accepted and appreciated. Like other types, they don’t want to feel pressured to act like someone they’re not. I’m sure they would love to be part of church groups where others value their unique perspective rather than trying to make them fit an established mold, but it’s rare that they find something like that. INTJs I’ve talked with often find it frustrating that their gifts and talents aren’t always appreciated by the church. My sister, for example, is an INTJ chemical engineer and she feels like there’s little room for her to share her keen insight, problem-solving capabilities, or engineering strengths in our local church group. She has, however, found a way to put her technical savvy to good use on the sound crew. Organizational skills are linked to an INTJ’s co-pilot Extroverted Thinking, which Personality Hacker nicknamed “Effectiveness.” Unfortunately, people aren’t always very open to hearing an INTJ’s perspective on how to make something in a church group more efficient. AC mentioned that she doesn’t “understand the need for constant activity at church. I think we should combine our efforts and resources and focus on very specific things.” INTJs have little patience or understanding for inefficiencies that could be avoided. If you’re in a church that prioritizes doing as many good works as possible, though, voicing a perspective like AC’s is more likely to get you shunned rather than start a discussion about how to do good work’s more efficiently. However, an INTJ in this situation isn’t saying the church shouldn’t do good works — they critique things in order to start discussion for the purpose of finding ways to do things better. 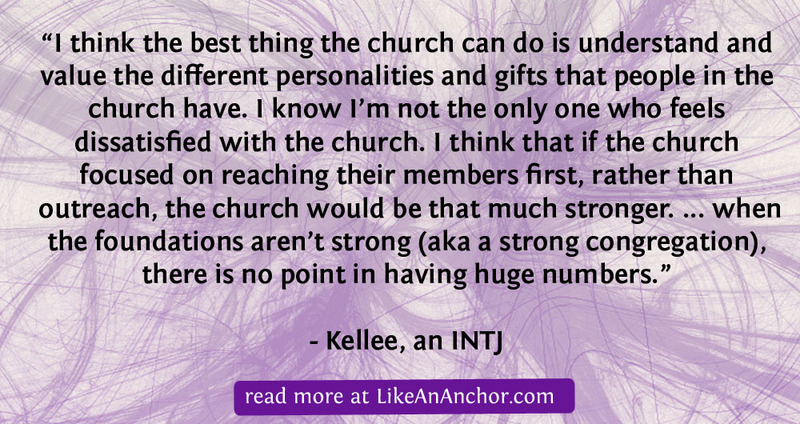 As a whole, INTJs want something more than to just be put in charge of running an aspect of the church. Many also have a deep desire to use their gifts to help other people. This might surprise people who’ve fallen for the stereotype that INTJs are cold and distant, but the truth is INTJs care deeply about people and long for opportunities to show that care in a way that’s natural to them. On the other hand, INTJs do not appreciate it when people make decisive or judgmental statements that they can’t back-up. They don’t come to church just to hear a motivational talk or listen to someone read from secondary-sources. They also don’t want something “sugar-coated.” One of the things Ina mentioned was that INTJs need “Honest direct communication,” which should be done without “exaggerating or belitteling others.” INTJs want to hear from the Bible and they want to talk about God’s word with other people who value scripture. 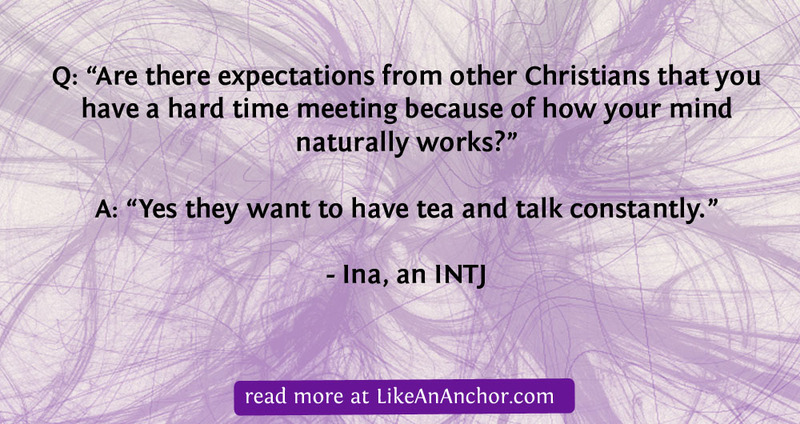 We’ve already talked about several challenges that INTJ Christians face, mostly from external forces at work in church groups. 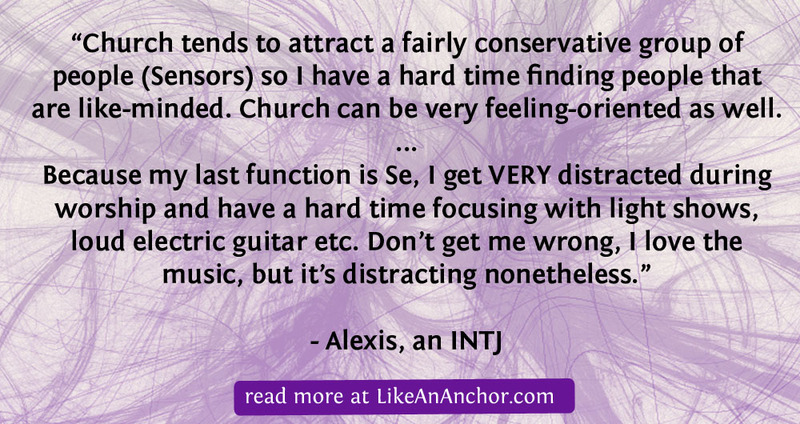 There are also internal struggles that INTJs (like all other Christians) face. If you’re someone trying to help an INTJ with their challenges, the best thing you can do is talk with and listen to them. They’re not going to open up about their struggles or respect your suggestions until they know you’ve taken the time to understand them and prove that you care about them. 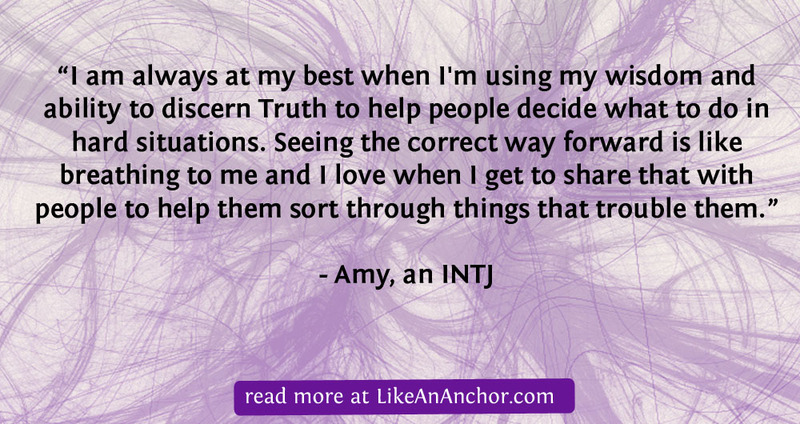 In fact, how other people respond to them is something INTJs are keenly aware of. Ina said that her biggest challenge is that she reads and thinks widely, but is not “able to share it with other Christians because they get easily upset and fearful.” AC said her biggest challenges are “distrust and bitterness” because of how she and her spouse have been treated by other Christians. Her personal faith was strengthened through these struggles, but her trust in other Christians was negatively effected. She also struggles with discerning which Christian teachers to listen to because there are so many out there offering contradictory perspectives and/or seeming hypocritical in how they preach the gospel. 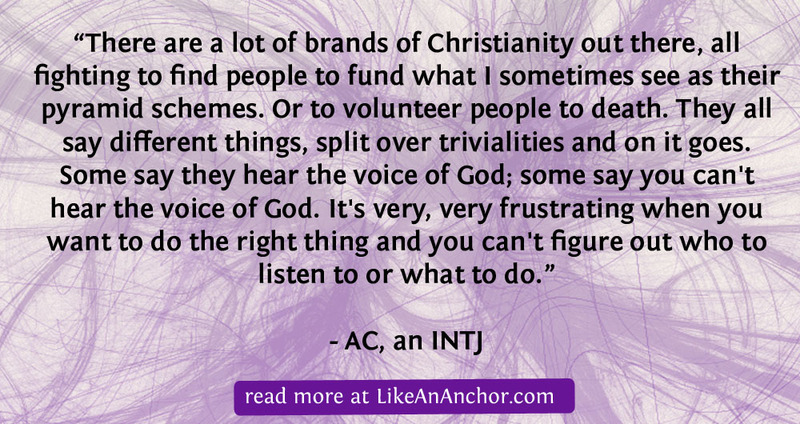 Once Christianity makes sense to an INTJ, they typically see no other way to go. It’s just logical for them to follow the only faith that holds-up to their scrutiny. It doesn’t matter what others say — it matters what makes sense to them and what they’ve experienced as real and trustworthy. “I believe the Bible because it is a light in a dark world. When you look at all the other belief systems, they have unfair, unjust weights and measures. And I don’t believe that, if a god like that was the true god, that we’d still exist. And the whole Bible makes sense! So many things are explained. It’s impossible for the universe to have occurred by accident, for instance. And at times, when I read the Bible, something will jump out at me, really speak to me. I believe that’s the way that God talks to us today, and that’s proof that he exists. Thank you so much to all the INTJs who got in touch with me, shared their perspectives, and let me quote them in this article. If you want to share your Christian INTJ story or talk about INTJs in the churches, comment here! 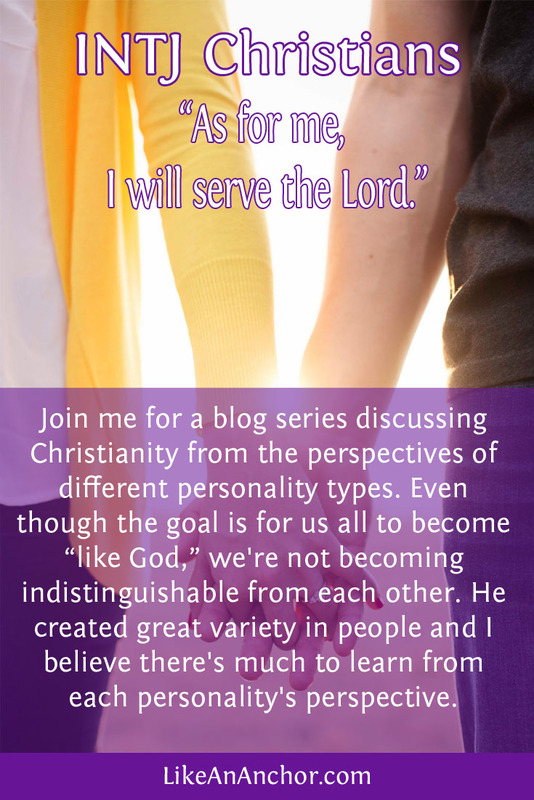 If you’re a different personality type looking to contribute an upcoming blog post in this series contact me or head over to the original post. I’d love to feature you! Please note: unless you tell me otherwise, I’ll assume that by getting in touch you agree I can quote you directly and credit you by first name (or screen name) and Myers-Briggs type in future projects. Thanks 🙂 I’m so glad you like it! An amazing read. Hooray for INTJ Christians.